I don’t often do the press release thing but given this is a great metaverse platform company from my neck of the woods (Melbourne and Brisbane – Australia) and this is beyond the vapourware we have seen from other players hoping to topple Linden and Second Life off their perch, I will make an exception. The key thing here is the marrying of a distributed Virtual World network (NICTA) with a very accessible, promising client I have been trying out (Vastpark). Things do look on track for end of 2008 which is not as bullish as predecessors, but still it will be 2009/10 before there is a significant community to rival Second Life who of course have their own distributed server plans. Anyway over to the PR release. (20 March 2008) NICTA, Australia’s Information and Communications Technology (ICT) Research Centre of Excellence, has signed a commercial license agreement with VastPark, a leading virtual worlds platform provider. Researchers at NICTA have developed a decentralised network engine for virtual worlds that can scale to millions of users, thereby enabling creators to develop and deploy online games and virtual worlds more efficiently and cost effectively. Massively multiplayer online (MMO) applications, such as large multiplayer games and on-line virtual worlds, have attracted an enormous user population on the Internet. In fact, thousands of users can be on-line simultaneously in the same virtual world. This creates a significant challenge for the creators of virtual worlds. The traditional client-server approach does not scale affordably as server capacity needs to be upgraded to meet the anticipated demand for a service; rich media content requires the underlying network to be upgraded to handle the expected network traffic; and central servers are a single point of failure and require constant maintenance. Ã¢Â€ÂœThis is great for VastPark as we want to make it easier for anyone to create and deploy their own virtual worlds and games without the headache of centralised server infrastructure. We also want to provide a unique user experience on our platform: we want users to know they can turn up at a location and no matter how many people are there, they should be able to see their friends rather than find out theyÃ¢Â€Â™ve been stuck on separate servers as often happens in games today,Ã¢Â€Â said Bruce Joy, CEO of VastPark. NICTAÃ¢Â€Â™s agreement with VastPark will provide VastPark with access to the Distributed Network Engine and the team behind it. The agreement also provides the NICTA team with a commercial platform to conduct a large-scale trial, and a commercialisation path with VastPark as an industry collaborator. Ã¢Â€ÂœThis is the beginning of what we expect to be a long-term relationship with VastPark as a partner in the development and commercialisation of the virtual world technology coming out of NICTA,Ã¢Â€Â Dr Kulkarni said. Ã¢Â€ÂœThis engine will complement our existing VastServer network engine that is designed using a traditional client server architecture. NICTAÃ¢Â€Â™s engine will mean that we can offer our world creators a level of low-cost scalability that is just not achievable otherwise. I canÃ¢Â€Â™t wait to see the impact this has on the market when it is released,Ã¢Â€Â adds Joy. Ã¢Â€ÂœI am delighted that NICTA is entering into this agreement with VastPark,Ã¢Â€Â NICTA Victoria Research Laboratory Director Professor Rob Evans said. The new networking technology is now being integrated into VastPark and there will be an announcement later this year about when the beta testing will commence. Testing is expected to begin towards the end of 2008. VastPark is a virtual worlds platform supporting an ecosystem of creators, consumers and user generated worlds. 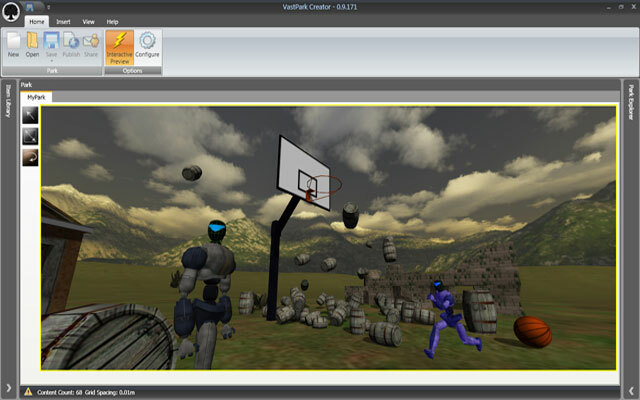 Built on five years of research and development and focussed on effective open standards, VastPark features free tools that enable users to create and publish 3D virtual worlds quickly and easily. Communities can create and monetize their own highly interactive worlds and empower their users creativity. National ICT Australia Limited (NICTA) is a national research institute with a charter to build AustraliaÃ¢Â€Â™s pre-eminent Centre of Excellence for information and communications technology (ICT). NICTA is building capabilities in ICT research, research training and commercialization in the ICT sector for the generation of national benefit. National ICT Australia is funded by the Australian Government as represented by the Department of Broadband, Communications and the Digital Economy and the Australian Research Council through the ICT Centre of Excellence program. NICTA was established and is supported by its members: The Australian Capital Territory Government; The Australian National University; NSW Department of State and Regional Development; and The University of New South Wales. NICTA is also supported by its partners: the University of Sydney; University of Melbourne; the Victorian Government; the Queensland Government; Griffith University; Queensland University of Technology; and The University of Queensland. LAMP, JustVirtual, Watercooler, GaryHayes.tv, Cubrisound, LAMP Wiki, MUVEDesign and a host of sharing portal channels, other wikis, forums and commercial sites which you can see on my Wikipedia profile. BLOGUILT n. 1. A feeling of inadequacy and self-reproach that comes from being time poor and not posting regularly to one or more blogs 2. Remorseful awareness of having done something wrong by not posting 3. Sinful feelings due to posting something weak and inferior due to the fact that you just should post something because it has been a while since the last one. Garys Full Wikipedia Profile Link. 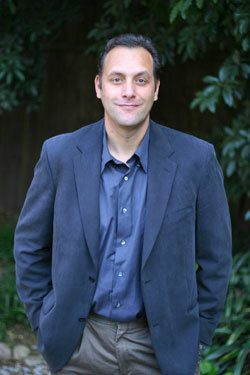 Gary is an award winning multi-platform producer, author, educator and Director. He was recently Senior Producer and Manager of Product Development at ABC TV Multi Platform responsible for delivering new editorial transmedia formats against ABC TV shows including dual screen, social TV, games and mobile. He founded the global training group StoryLabs.us in 2010 (previously founding and running innovation lab LAMP from 2005-10) growing innovative multi-platform, game, virtual world and transmedia productions. He is also currently CEO of Augmented & Virtual Reality company MUVEDesign.com (multi user virtual environments) and creating branded & story based multi platform for major brands. Gary was previously Senior Development Producer and Manager at the BBC in UK for 8 years – delivering interactive Social TV, broadband internet and emerging platforms to millions of UK users. After 2 years in the US as interactive producer and consultant Gary then became the founding director in Australia of the Innovation Training Unit LAMP.edu.au via AFTRS between 2005-10. He recently became a Distinguished Talent permanent resident in Australia and since 2005 runs the top ten AdAge Power150 Media & Marketing blog covering personalized pervasive entertainment, personalizemedia.com. Gary designed & lectured full time multiplatform courses at MetroScreen and AFTRS and adjudicates on Virtual Reality and Multiplatform for several Government Screen funding organisations and has been an award juror for many years including the International Interactive Emmy’s and recently Banff Media. After many years working in the UK’s Music and Multimedia industry Gary joined the BBC in London as a multimedia editor and quickly became a Senior Development Producer then Manager and leading thinker in the BBC’s development of the internet, interactive TV and emerging platforms from 95-04. He devised & produced many of the BBC’s ‘firsts’ – Digital Text, the first broadcast interactive TV service – ‘Nomad’ the first live internet documentary – ‘X-Creatures’ the first interactive broadband TV service and even introduced the first video and audio onto the BBC’s internet sites in 1996. Gary produced and devised over 20 other eTV and broadband TV services including Top of the Pops, Travel Show, State Apart and several future BBC cross-platform navigators. He also initially conceived, with the linear show producers, award winning iTV projects such as Antiques Roadshow, Walking with Beasts & various BBC iTV game formats. 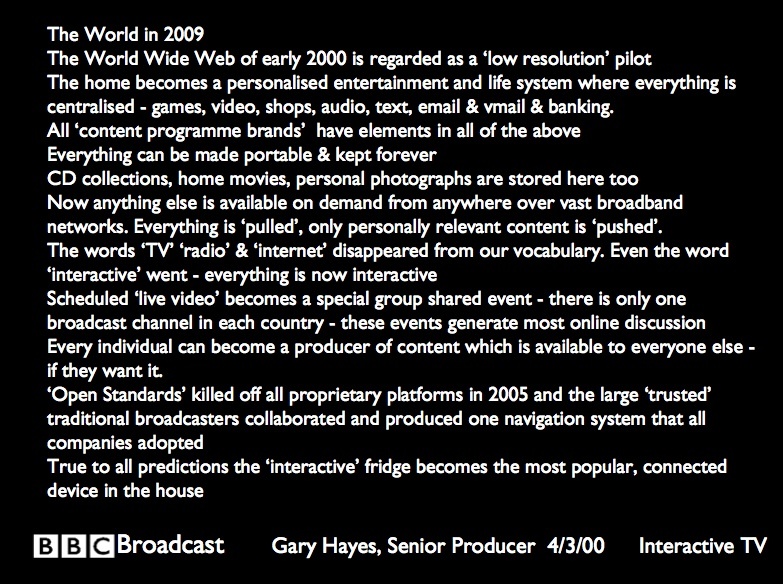 Gary created numerous courses, incubators and seminars on Interactive thinking for linear producers, was active in the Blue Sky Imagineering and R&D depts looking at personal TV and virtual spaces and was a leading part of BBC strategy teams from 2001 in preparing for on-demand, cross-platform services. Living & consulting in the US during 2004-5 he line produced Showtime’s PVR enhanced L-Word, as part of AFI digital labs and devised a range of new on-demand program formats for two national TV networks. Gary also produced & chaired conferences around LA including Hollywood industry panel seminars and Digital Days both looking at emerging media super-distribution models. He also chaired the TV-Anytime Business Models Group from 99-03 (the lead media-on-demand standards body) and co-authored a Department Trade and Industry Report on Personal Video Systems. He has been an International Interactive Emmy juror for several years. Between 2005 -10 Gary was the Director the Australian Laboratory for Advanced Media Production run through AFTRS (Australian Film TV and Radio School) and based in Sydney and was probably Australia’s premier emerging media R&D and production labs. It combined seminars, workshops, immersive rapid prototyping residentials and industry focused product development. Through AFTRS he also ran workshops in multi user virtual environments (MUVE) for cinematographers, designers, script writers and directors exploring the potential of shared social online virtual spaces for collaborative production, creativity and education. From a commercial perspective Gary is CCO and Head of Virtual Worlds with MUVEDesign (and previously the Sydney based Project Factory respectively) pioneering alternate, augmented & virtual world creation and immersive & organic story experiences for TV/Film, Education, Business & Performance. MUVEDesign are currently building and devising commercial and game-like services in Transmedia, Augmented Reality and also virtual worlds, having recently produced and built major Second Life Australian presences including Telstra, ABC, MultiMedia Victoria Laneways, Deakin University, AFTRS, Thursday’s Fictions & other Fortune 100 companies in Second Life. He runs a fictional MUVE blog JustVirtual and a renowned top 10 Australian Media and Marketing blog on media personalisation, digital brands, new media forms and creativity at www.personalizemedia.com and has presented at over 450 conferences on subjects ranging from Transmedia, Augmented Reality business, Advanced and Interactive TV, Personalization, Brands and Education in Virtual Worlds, Media Futures and Interactive Art and Music amoungst others. As a published music producer, composer and performer he has had over 200 works performed live and on TV/Film and Radio. www.TheProjectFactory.com – Gary was Head of Virtual Worlds from 2007. The BBC Musical Nomad – a reconstructed blog site from a live webumentary project (live satellite blogging from Central Asia in 1997) originally at bbc.co.uk/nomad from 1997 – 2008.